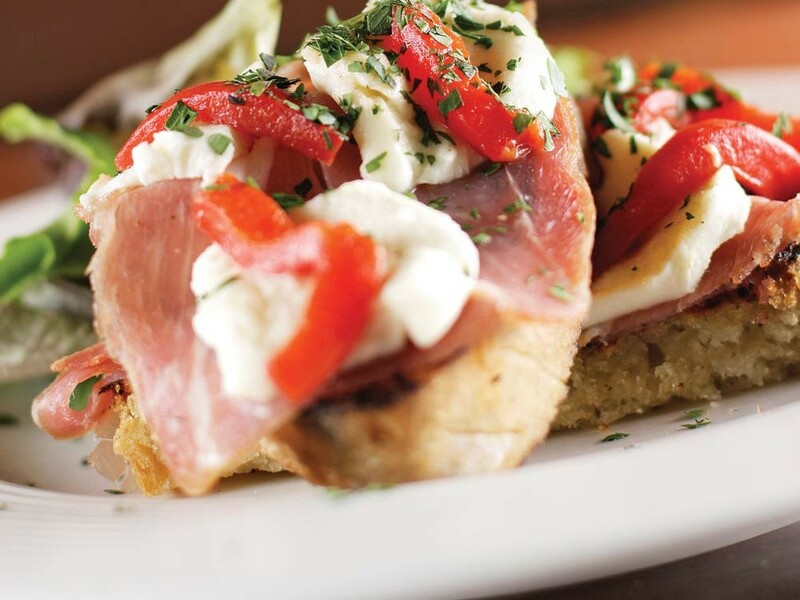 Italia Trattoria's prosciutto bruschetta with roasted red peppers and fresh mozzarella. If you are searching for a platter of cheese-oozing lasagne, endless breadsticks or chicken Marsala, then Italia Trattoria is not for you. This restaurant, which opened in Browne’s Addition last summer, employs a more finessed, but highly approachable, take on Italian cuisine. On a recent abysmally rainy evening, my companion and I stopped in for dinner. Moods were not great. Was it the unrelenting “wintry mix”? Kids who seem to never stop fighting? My companion’s ridiculous — he’ll dispute this — driving? My helpful (or so I thought) critiques? All of the above? As we stepped into Italia Trattoria, we were greeted like old friends. Did we want to hang up our coats? How about this table? Tensions began to ebb. We sat at a corner table — I even got a throw pillow for comfort. Beneath the warm orange walls, overlooked by giant close-up paintings of pasta shapes, we pondered the Italian wine list and menu. Frankly, we were looking to be transported. And we weren’t disappointed. Italia Trattoria seems to summon the essence of Italy, even on a raw wintry evening some 6,000 miles away. The antipasti menu features a number of intriguing options — from familiar grilled pizzette with arugula, salami and fresh mozzarella ($11) to a creative offering of grilled sardines with white bean puree and green-olive relish ($8). For the more adventurous, there’s grilled lamb’s tongue with arugula salad ($11) or charred octopus with spicy tomato oil ($9). We went with the tuna crudo with capers, garlic oil and fennel crackers ($9). Here, the (raw) tuna was minced and mixed with a bit of finely chopped red onion, and served with garlic oil, a small mound of arugula tossed in vinaigrette and crispy fennel crackers. Mingled together, the flavors were perfectly pure and well balanced. Exactly right. Next up were the insalate. “Hands-down,” our server recommended the roasted beet salad ($8), even though, “we also have the best Caesar in town.” They were kind enough to split it for us. The salad greens were lightly dressed in a pungent, garlicky hazelnut vinaigrette, which kicked up the flavor of the creamy gorgonzola crumbles and the toasted hazelnuts — ideal contrasts for the rich, soft beets. We did not leave a leaf uneaten. In an Italian meal, primi courses usually consist of pasta, and our server tells us that chef Anna Vogel makes all the pastas (with the exception of the spaghetti) fresh each day. The ricotta and spinach agnolotti (think little ravioli) sounded decadent, with their sage brown butter ($15). And the pappardelle lamb ragú ($14) is on my list to try on a future visit. But since we had missed out on the sardines in the antipasti course, we opted for the fettuccine with sardines ($13) as our primo. This creation was like summer in a bowl. The salty sardines smelled of the ocean, and the generous ribbons of fettuccine were silky and sensuous like a breezy warm afternoon. A fine dice of red pepper accented the green olives and tomato sauce to perfection. Again, nothing remained. Secondi courses feature a protein — beef, fish, poultry or lamb — and a unique set of accompaniments. A roasted game hen is served with grilled broccoli and roasted potatoes ($18), while grilled trout ($16) steps out with braised savoy cabbage. So if you’re planning a multi-course dinner and don’t want to repeat elements (say, have gnocchi in two consecutive courses) you’ll have to plan ahead. We plotted our evening around the lamb T-bone with squash gnocchi, grilled romaine and red-wine jam ($22). Cooked to perfection, these two steaks were incredibly rich and flavorful. And tiny — no more than four or five bites of meat on each. Still, not to be missed. The rest of the dish was delightful as well. I did not know that grilled romaine could be so tasty, or that I would have such an outpouring of affection for my companion when he selflessly gave me his last morsel of golden sweet potato gnocchi. The generous dollop of sweet, sultry red wine jam only heightened the experience of the grilled meat. Altogether, a sumptuous main course. And yet we were still hungry. So desserts were in order. I ordered the chocolate truffle cake with zabayon. It’s a decadent creation: fine-grained chocolate cookie crust, a luscious bittersweet chocolate truffle mousse filling, topped with whipped cream and accompanied by dollop of the eggy custard. Scrumptious — especially with a few sips of the big, fruity Italian red recommended by our server. Equally successful but entirely different was the amaretto cake with pear compote ($7) that my companion sampled. The almond flavor sang out, supported by the mildly sweet delicate pears. Every morsel of food on each of our plates throughout the evening had vanished — perhaps the first time that’s ever happened. And I’m certain we could easily have polished off a second secondo, despite sharing three courses before that. The portions are undeniably small, so achieving satiety for many diners could get a little expensive at Italia Trattoria. Nonetheless, it is hard to argue with the near-perfection of everything we ate. As we walked out into the rain, I was reminded of the power of a lovingly prepared meal to transform your outlook on life. Hard to put a price on that.